The flash results from yesterday’s Allsop Space auction at the Shelbourne hotel in Dublin are available here. This blogpost aims to provide an analysis of the results. The auction catalogue is available here. What does it tell us about prices? The folks at Irish Property Watch were quick to compare the settled prices yesterday with prices advertised at the peak. And although not totally scientific, the results indicate average 67% drops from asking prices in 2007 to “hammer” prices yesterday. The country’s national indices indicate we are 33-60% off peak with the main index from the CSO indicating we are 43% off peak. Yesterday the main auctioneer Gary Murphy wryly remarked to one punter that “it wasn’t serious, it was only money and in this climate it was likely to be yours” reaffirming anecdotal evidence that mortgages are still hard to secure. The term “fire sale” typically applies in situations where there is no financing available so you could correctly terms yesterday’s prices “fire sale” prices. What does it tell us about yields? With Ireland’s 10-year bond producing 8.7% at present which is traditionally supposed to be the risk free rate of return on investments, you would expect yields on property to be significantly more. In fact the yield analysis below would tend to suggest a return of around 10% but there are very wide variations and much uncertainty with rents – in the case of commercial rents, changes to upward only rent reviews loom, and in the case of residential rents it seems practically certain that rent allowance rates will be cut in the December budget which is likely to remove support for private rents generally, which have been more or less flat for the past 20 months. So I would have said that a 10% return suggests a degree of tentative confidence in future prices, but remember that is on the basis that prices have dropped about 60-70% from peak. What does it tell us about the appetite for property investment/purchase? Reporting yesterday put the number of attendees at the auction at between 700-1,000. And pre-auction, there was considerable interest in the properties even if the mania of the first auction in April 2011 was not repeated. I think there will be relief all round that the 14-apartment, four-commercial unit building on Prussia Street sold for €1,150,000 but with a yield of 9.7% plus seven apartments and one commercial unit vacant, it was hardly a terrific price – probably €60-70,000 per apartment. It will also have been a relief that a 12-apartment block in Wexford sold for €470,000 but again hardly a reassuring price. 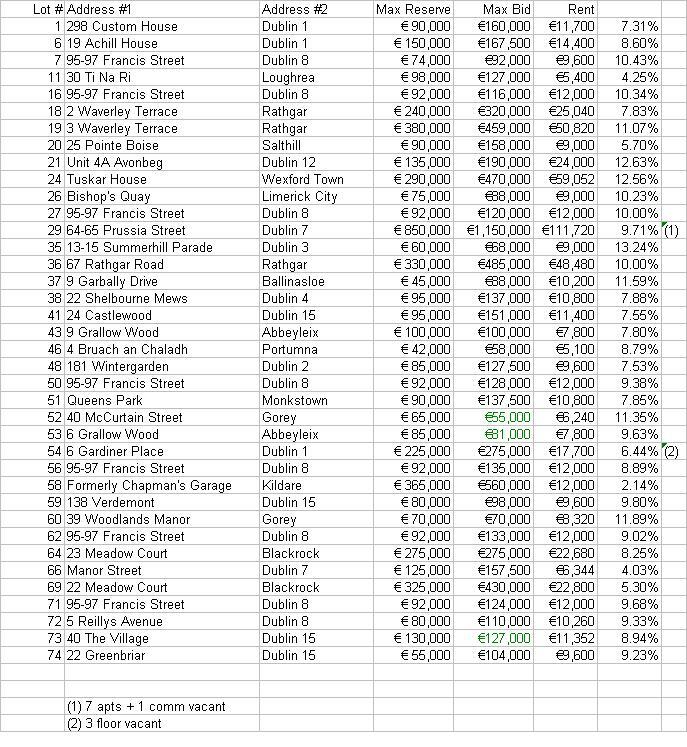 More lots went unsold yesterday and the €9.5m receipts were considerably down on the previous two auctions, though with just 67 lots on the day and no prime property on offer, that result isn’t surprising. What does it tell us about Allsop/Space? To my mind, the partnership yesterday delivered a successful auction. Again the properties were well-marketed beforehand, on the day Gary Murphy was again the maestro coaxing out maximum bids, the bidding and results were transparent, someone who wished to press a right of way with respect to one property was treated courteously and given the floor to make a statement. It is certainly the case that more properties remained unsold after their turn, but of the 11 unsold, practically all went unsold having reached 90% of the maximum reserve. Two didn’t – 8, Finglas Road in Dublin 9 which only reached €185,000 against a maximum reserve of €230,000 and 35 Grallow Wood in Abbeyleix which only reached €64,000 against a maximum reserve of €75,000. I wonder if there were repossession and social issues in play in respect of the Abbeyleix property. Galway auctioneers, O’Donnellan Joyce, claim to be the most successful auctioneers in Ireland– “last year 2010 O’Donnellan & Joyce placed 39 properties for auction with an 80% success rate, which is the highest in Ireland”; so even with a 85% success rate yesterday, Allsop Space is still comfortably more successful and considering that 56 properties sold with at least 2 more after the hammer came down, I don’t think Allsop Space will be too perturbed. The protest outside the auction. Both the Irish Times and the Irish Independent reported on a protest outside the auction. And on RTE News, one protester called attention to the spectacle of a British auction company in a luxury Dublin hotel selling property repossessed from Irish citizens. David Hall of New Beginning told this blog “The purpose of the protest was to highlight the need for Government politicians’ will to introduce solutions to the personal debt crisis. There were three properties that were being auctioned where the owners had to hand back the keys. There is a human story behind these auction lots – they are not just lot numbers” Allsop Space claimed that this auction yesterday had a larger proportion of non-distressed property, but these auctions were always treading on thin ice with respect to distressed sales, in a country where the maximum bid today on a repossessed farm will be €1 and where there is a difficult history with dispossession, evictions and bailiffs. I think it only fair to point out that Allsop in particular do what they do well, the properties are marketed, the auction process is transparent and the results provide a unique source of price discovery in a country where the politicians have yet to implement a House Price Database. Future auctions: the next Allsop Space auction is scheduled for 30th November, 2011 with the auction catalogue available from 6th November, 2011. There is informed speculation that the next auction will be bigger with 100+ lots. There is also likely to be more competition with NAMA about to bring more property to market with the launch of the NAMA mortgage product, IBRC (Anglo and INBS to you and me) said to be about to sell 150 properties, and the ghost estate committee must be closer to bringing some of those vacant completed homes to market. There was talk of Savills, Knight Frank andWilsons holding auctions, but there are no concrete details as at present. UPDATE: 26th September, 2011. In respect of the seven withdrawals before the auction, Allsop Space Director of Auctions Robert Hoban said the number represents a a proportion more in line with the norm for large auctions. With respect to the 11 properties that went unsold in the auction itself (some of which later sold), Robert says the number of unsolds “is more in line with the norm for large auctions of this type. In fact it is exactly in line with Allsop’s UK average. I think the results of the first two auctions were always going to prove above average with the extra media attention and hype surrounding the events.” Lastly he said that there is seemingly a trend whereby the auction attendees are more business focused than previously where there was a fair proportion of onlookers. According to Allsop Space, some 1,100 people attended the auction on Friday.